Project Starshine (Student Tracked Atmospheric Research Satellite for Heuristic International Networking Equipment) are optically reflective spherical student satellites, which have been designed by the U.S. Naval Research Laboratory and built by an informal, volunteer coalition of organizations and individuals in the USA and Canada. The satellite is covered by approximately 1500 small, front-surface aluminum mirrors that are machined by technology students in Utah and polished by tens of thousands of students in schools and other participating organizations around the world. These mirrors have been coated with a scratch-resistant, anti-oxidizing layer of Silicon Dioxide by optical engineers and technicians at the Hill Air Force Base in Utah and the NASA Marshall Space Flight Center in Alabama. During the satellite's orbital lifetime, faint sunlight flashes from its mirrors were naked-eye visible against the star background, during certain recurring morning and evening twilight periods, to student and adult observers around the world. These observers measured the satellite's right ascension and declination by reference to known stars, and they recorded the precise timing of their observations by the use of stopwatches synchronized with international time signals. They used GPS receivers or United States Geological Survey 7 ½ minute quadrangle maps, or their equivalents in other countries, to measure the latitude, longitude and altitude of their observing sites. They posted their observations and station locations on the Starshine web site to permit computation of the classical elements of the satellite's orbit by the angles only method of LaPlace. From day to day, the period of the satellite's orbit grew shorter, due to the aerodynamic drag. Students measured the magnitude of the daily decrease of period and deduced the density of the earth's upper atmosphere that produced the drag that shortened the satellite's orbital period. They also kept track of fluctuations in intensity of extreme ultraviolet radiation from the sun, as measured by instruments on the SOHO satellite. They related fluctuations in intensity of solar activity to changes in the rate of decay of the satellite's orbit and thereby to variations in atmospheric density. A third satellite, Starshine 3, was launched on an Athena-1 unmanned launch vehicle out of the Kodiak Launch Complex, Alaska, on 29 September 2001, into a 470 km high circular orbit, inclined 67 degrees to the earth's equator. This orbit was chosen to make the satellite visible to observers located from the equator all the way up to latitudes of 70 degrees north and south of the equator. Starshine 3 was nearly a meter in diameter, weighed 91 kilograms and carried 1500 mirrors that were polished by approximately 40,000 students in 1000 schools in 30 countries. It also carried thirty one laser retro-reflectors on its surface. Additional instrumentation included an integrated power supply, consisting of combined solar cells and thin film batteries, as well as an amateur radio telemetry transmitter (SO 43, Starshine OSCAR), a command receiver, a rechargeable battery, a secondary solar array, signal-conditioning circuitry, and an antenna array. This satellite was initially spun at 5 degrees per second by its Lightband deployment system, and that spin rate decreased essentially to zero by the end of its third month in orbit, as measured by its radio telemetry system. 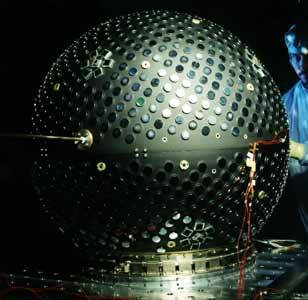 Starshine 3 completed 7434 orbits of the earth before flaming out in the earth's upper atmosphere on 21 January 2003. This was nearly two years earlier than originally predicted, because increased solar activity.